Home > Social Media > How Do People Communicate on Social Media? A baby boomer in the Midwest wants to see what her grandchildren are up to, so she opens Facebook and looks for pictures, which she then shares on her own timeline. Meanwhile, a millennial on the West Coast wants to let his friends on the East Coast know about a new band he happened to see in concert, so he floods his Instagram feed with videos. Elsewhere, a Generation Xer wants to promote a cause that is near and dear to her heart, so she takes to Twitter to retweet poignant tweets from celebrities and political figures so her followers can also spread the word. And finally, a teenager looking to make a splash uploads a video to YouTube in the hopes of getting likes and shares while creating a buzz. In all of the above scenarios, we see the power of social media as a communication tool. No longer is digital communication just a one-to-one channel. Rather, through the functionality of today’s social media platforms, communication exists in both one-to-many and many-to-many states. Social media is ingrained in our society, which means that businesses today have a much better opportunity to reach potential customers through social media than through any other means of traditional or digital marketing. 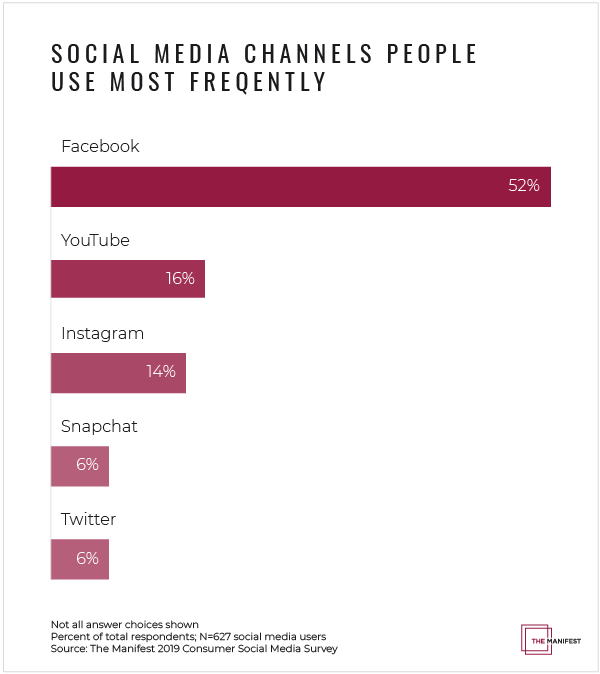 The usage statistics for social media are staggering. For instance, did you know that nearly everyone interacts on social media by posting content/updates (94%), with nearly half of social media users (42%) doing so at least once per day? 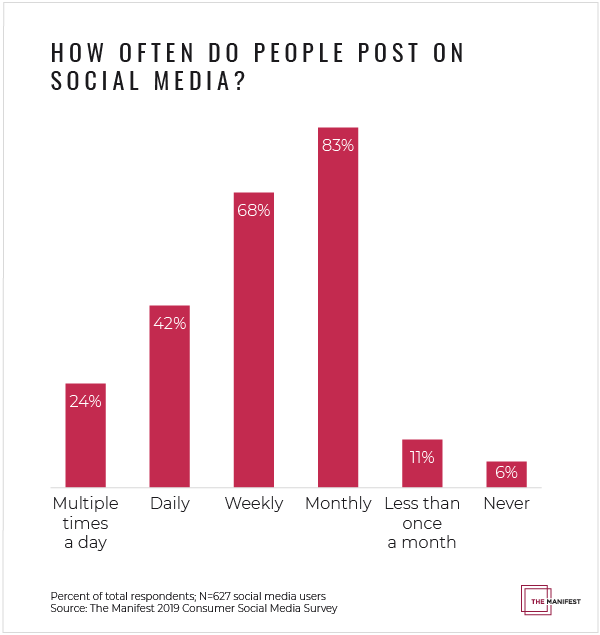 In addition, nearly one-third (30%) of people like, share, or comment on social media posts at least 10 times per day. 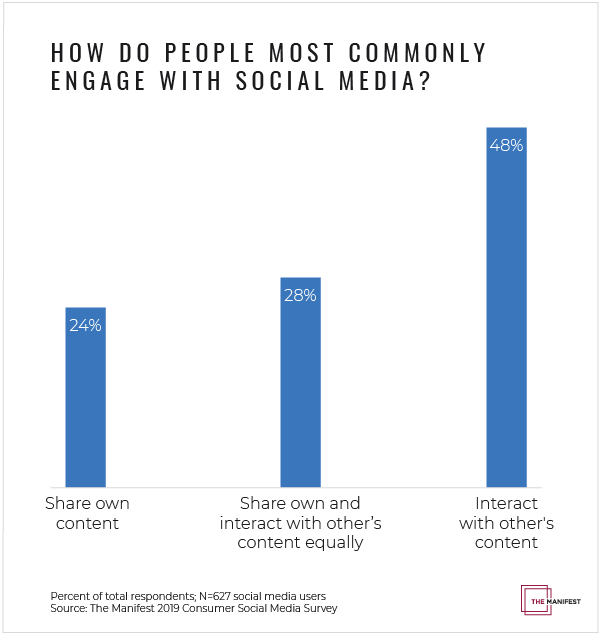 Finally, nearly half of social media users (48%) are more likely to like or share someone else’s content than share their own content (24%). This can be particularly useful to businesses who use social media to reach potential customers, as content can be shared quickly and easily among the target audience. With so much social media activity taking place, it may be difficult for a business to understand what social media platform offers the most potential to reach targets or what types of content get the most attention. Despite the data privacy fiasco unveiled last year, Facebook still rules the social media roost. More than half of social media users (52%) most frequently use Facebook compared to other social media sites. 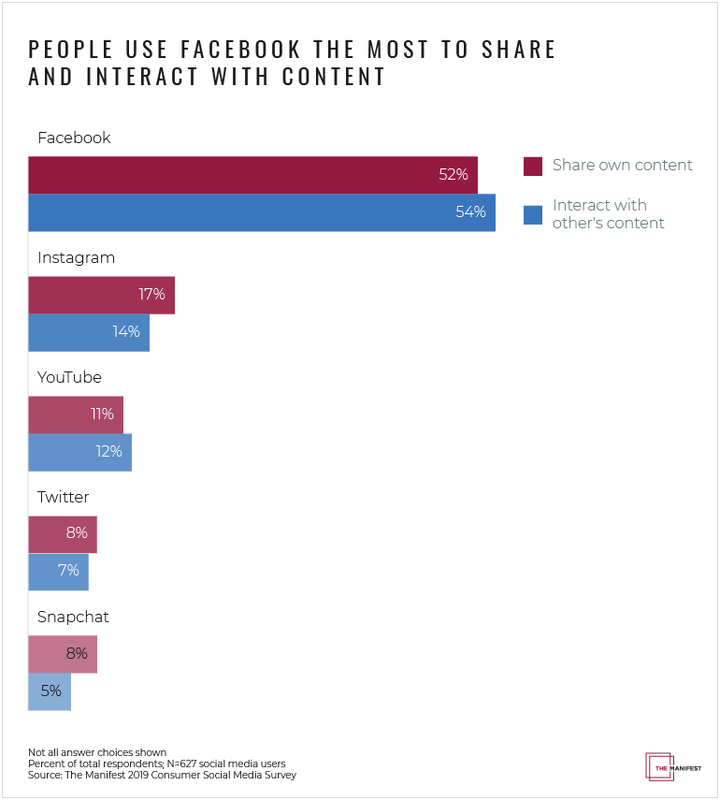 Facebook is also the most popular channel for people to share their own content (52%) as well as like or share someone else’s content (54%). That means that Facebook is a target-rich environment for businesses. Successful promotional efforts should mimic the types of content that are most popular among Facebook users. Mirroring that content will increase the likelihood that the content will be viewed, liked, and shared. 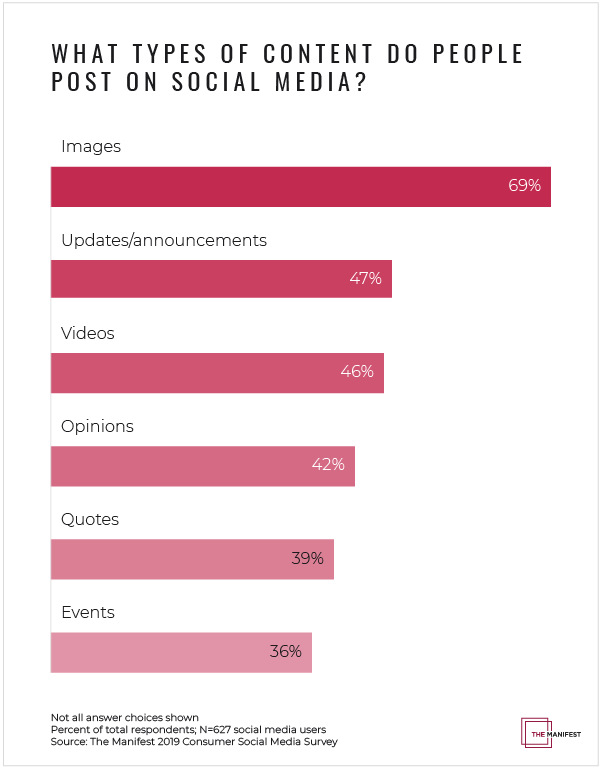 Images are most popular on social media – 69% of people regularly post them. From selfies to scenic settings to funny photos, images flood our timelines numerous times each day. Meanwhile, life updates/announcements (47%) and videos (46%) round out the top three. For a business to properly promote itself on Facebook (and social media in general), the posts it creates should mimic the “regular” posts that people are used to seeing repeatedly. The most successful Facebook campaigns stay true to the formula that people have come to know and replicate. Although Facebook has the majority of social media users, that doesn’t mean that social media marketing should focus solely on that platform. To ensure that you don’t miss any potential target audiences, a diversified approach is your best strategy. Social media, for better or worse, has become the preferred method of mass communication in our society. Businesses can take advantage of our social media dependence and use the platforms to actively promote products and services. No longer can businesses say they don’t have the time or manpower to have a social media strategy – when social media agencies are so readily and affordably available, there is no excuse. By producing content that mirrors the traditional uses of social media, busin esses can make the most of liking and sharing to spread their messages quickly, effectively, and inexpensively to a broader audience of potential customers. Kristen is a content writer and marketer at The Manifest, a business news and how-to website in the heart of Washington, D.C. Connect with her on LinkedIn, or reach out with any questions, comments, or concerns at [email protected] or on Twitter.